As you approach Mendes you feel as if you’ve stumbled into another time. 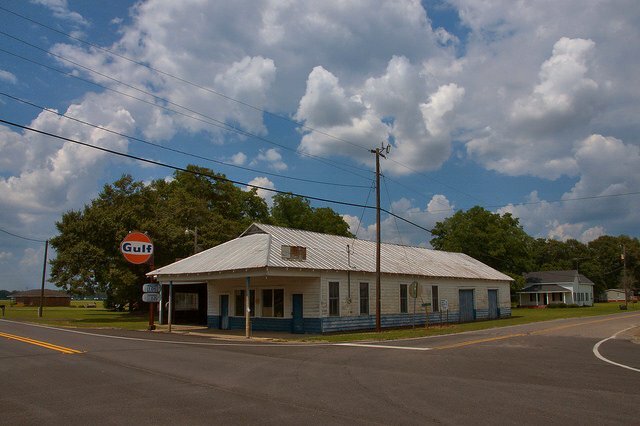 Waters Service Station’s bright orange Gulf Oil sign stands like a beacon for the surrounding farmland. My first photograph of the store was featured on the Daily Shot on Garden & Gun‘s blog in 2013, and remains one of my favorites. This was my grandads store. Now my dad owns it. I remember sprite in a bottle with peanuts in it was my favorite. Awwwww! That is my Papa’s store. I miss him sooooo much! I would always get coke & peanuts. Once in awhile I could get a can of sardines! Thanks for the memories!! Loved stopping by Mr. Olen’s store, he always had some chewing gum for me and all the kids. Love Mendes. Born and raised in Mendes Ga. No other place like it. My parents were Marquette Ruth Durrence and JoAnn Sands Durrence. Dads mom was Ruth Purvis Durrence. Love this town and always will! So so many memories! My dad grew up in Mendes about a half mile from this store. My Granddaddy used to take us kids there on Saturdays and buy us bottled coke and penny candy! I can still remember the lady’s name that used to run it….Ms. Ruby Jean. Such sweet memories. We also used to play in the old Mendes school house where my dad went to school as a child. It is no longer there now. Thanks for posting!! Been past it many times. Love it more each time. Takes me way back.